Karina's Kreations: Super Fun Stamp Night Swap!!! Super Fun Stamp Night Swap!!! My super fun stamp night is this Friday and this is my swap for the evening. I inked the Festive Finishes Pick a Pattern Letterpress Plate #124097 $9.95 with Real Red Craft ink and a brayer and rolled it through the Big Shot on Whisper White card stock. Tip: Squeeze some Craft ink refill into a plastic container that your wood mount stamps come in and roll your brayer through the ink to get even distribution. Then roll the ink onto the letter press plate. It works like a charm!!!! The stamp set is Pines & Poinsettias #123762(W) $24.95 or #123764(C) $17.95. 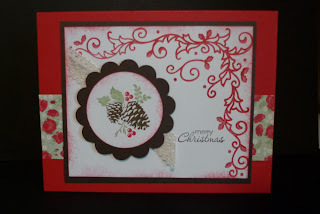 The image was color with Stampin' Write Markers and stamped on Whisper White card stock. So quick & Easy!!! The greeting is from Petite Pairs #122495(W) $35.95 or #122497 $25.95. This is a great set and has 18 greetings in it. 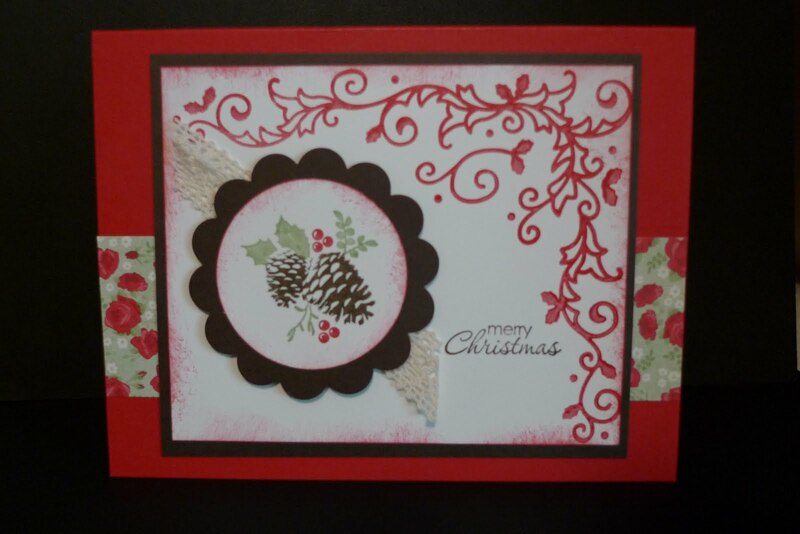 I had to use Holly Berry Bouquet Designer Series Paper #124004 $15.95. I love this paper!!! !